Who’s Who and Doing What in Projects? 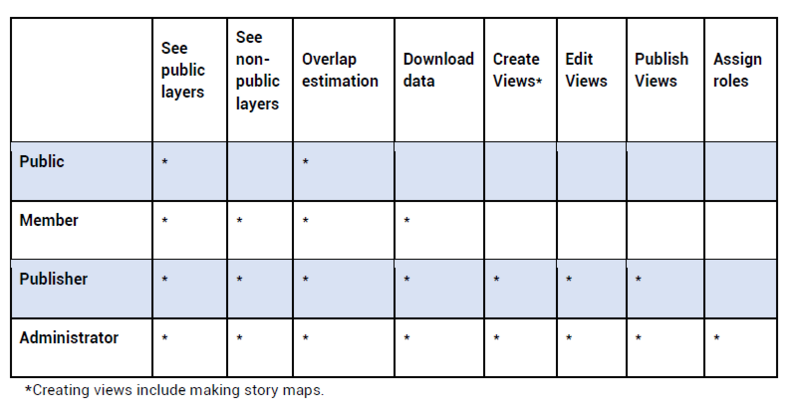 What data a user can see, publish and edit is dependent on their user status. There are four types of users that exist in MapX: public, member, publisher and administrator. User status is defined for each project and therefore changes from project to project. An account can have a public role in a project X while being a member in a project Y and an administrator in a project Z at the same time. Accept or deny membership requests to the project that are being sent by other users. User privileges are shown in the below table.